Honeywell announced its new Basic Board Mount Pressure Sensors, Compensated, Unamplified, TBP Series. These new sensors are designed for customers who require a simple, basic performance, mV output sensor that is compensated and unamplified so they can do their own amplification while retaining maximum resolution. The TBP Series, used to measure gauge pressures, may potentially be used in medical applications including hospital beds, oxygen concentrators, wound therapy and blood pressure monitoring, and industrial applications such as HVAC transmitters, air movement control, environmental control, leak detection, pneumatic controls and other commercial applications. Gauge pressure sensors are referenced to atmospheric pressure and provide an output proportional to pressure variations from atmosphere. They are intended for use with non-corrosive, non-ionic gases, such as air and other dry gases, and for non-corrosive, non-ionic liquids when the silicone gel coating option is selected. The sensor are designed and manufactured according to ISO 9001 and are ROHS compliant. 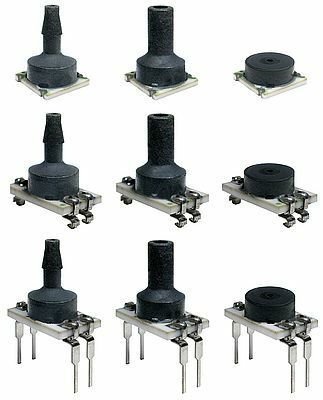 The TBP Series Basic Board Mount Pressure Sensors offer a wide pressure range (1 psi to 150 psi, 60 mbar to 10 bar, 6 kPa to 1 MPa) and an operating temperature range from -40 °C to 125 °C (-40 °F to 257 °F) and a 0 °C to 85 °C compensated temperature range. Their size of 7 mm x 7 mm (0.276 in x 0.276 in) is very small when compared to most board mount pressure sensors, simplifying installation. The sensors have an unlimited shelf life after the packaging is opened, can be calibrated within one hour after reflow solder, and are compatible with modern lead-free, no-clean solder processes.